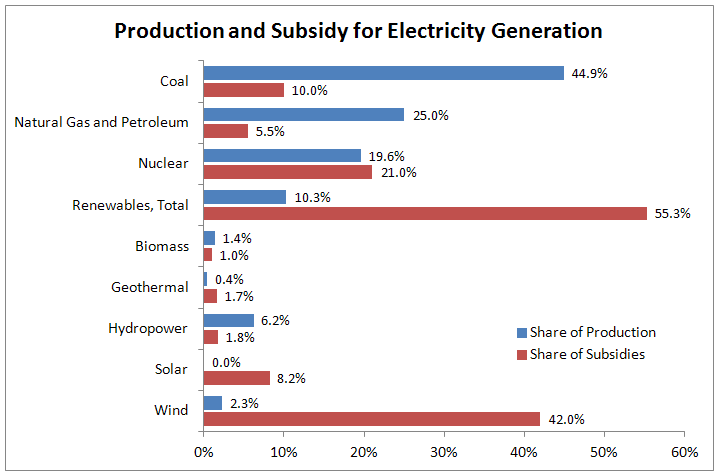 To compare federal subsidies for the production of electricity, we must consider subsidy values in proportion to the amount of electricity generated, because the magnitude is vastly different. 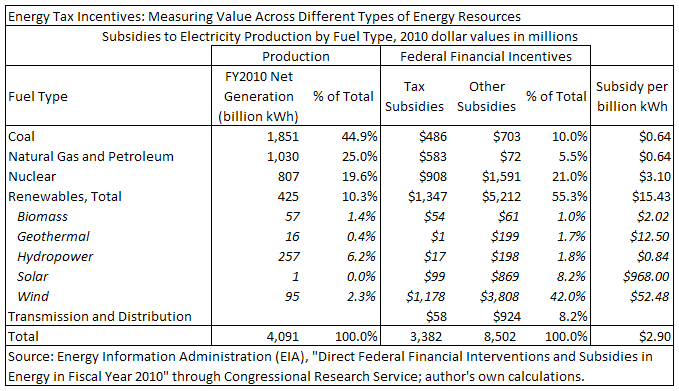 When comparing federal subsidies for the production of electricity, it’s important to look at the subsidy values in proportion to the amount of electricity generated. That’s because the scales vary widely. For example, in 2010 for the United States, as can be seen in the accompanying table, coal accounted for the production of 1,851 billion kWh (or megawatt hours) of electricity production. That’s 44.9 percent of all electricity produced. Solar power accounted for the production of 1,851 billion kWh, which is 0.025 percent of all electrical production. Solar power, however, received 8.2 percent of all federal subsidies, or about 328 times its share of production. 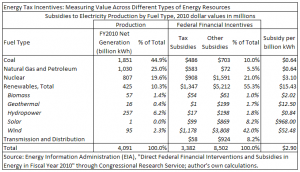 The nearby table and chart are based on data from the Energy Information Administration (EIA), Direct Federal Financial Interventions and Subsidies in Energy in Fiscal Year 2010 through the Congressional Research Service, along with the author’s calculations. Click table for larger version. 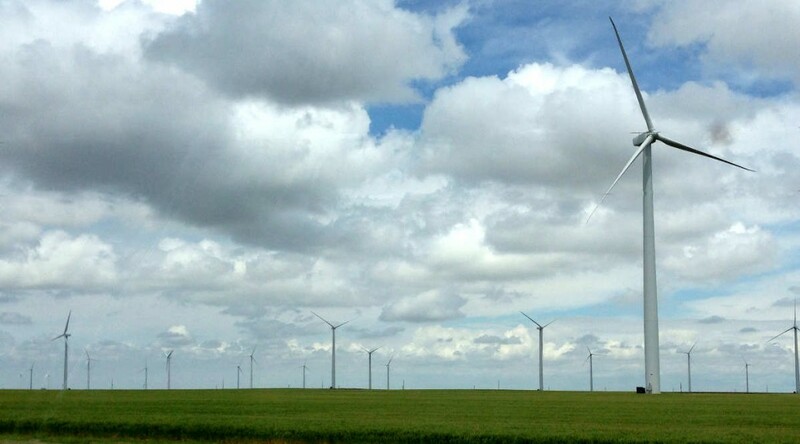 Of particular interest is wind power, as it receives subsidy in the form of cash equivalent tax credits, and many states (including Kansas) have mandates forcing its use. For the year covered in the table, wind accounted for 2.3 percent of U.S. electricity generation. It received 42.0 percent of federal energy subsidies. Voice for Liberty Radio: Hydraulic fracturing: A conjured-up controversy? In this episode of Voice for Liberty Radio: Dwight D. Keen is former chairman of the Kansas Independent Oil and Gas Association. 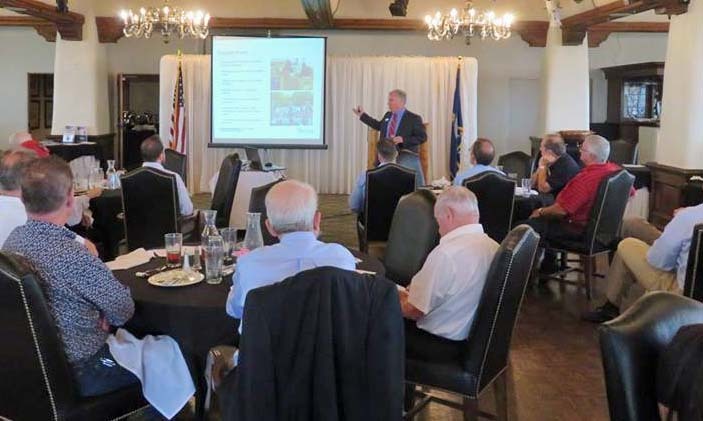 He spoke to the Wichita Pachyderm Club on the topic “Hydraulic Fracturing: A Conjured-up Controversy” on August 8, 2014. In the shownotes for this episode you can find the link to the short video that was shown as part of his talk. Also, you will find links to the handouts he distributed. 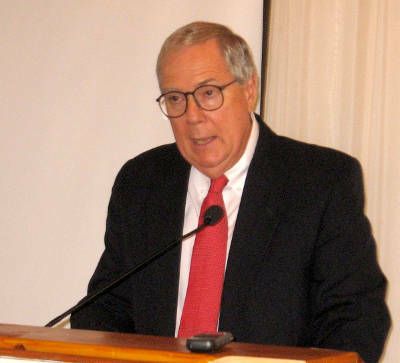 Here’s Dwight Keen at the Wichita Pachyderm Club on August 8, 2014. Commentary from Kansas Policy Institute. A recent Kansas City Star editorial criticizing opponents of Kansas’ renewal energy mandate for being disingenuous was itself a fine example of disingenuity. They falsely say “these laws encourage electric facilities to supplement their use of fossil fuels with renewables.” The law does not “encourage;” it requires. The Star touts economic gains to the wind industry but ignores the reality that those gains come at the expense of everyone else in the form of higher taxes, higher electricity prices and other unseen economic consequences. They conclude by saying people “deserve a choice”, but mandates are the opposite of choice. Real choice would not only allow citizens to individually decide whether to purchase renewable energy, but to choose their energy supplier as well. Maybe it’s time to look at breaking up the utility monopoly in Kansas as other states have done. U.S. Representative Mike Pompeo, a Republican who represents the Kansas fourth district, and U.S. Senator Lamar Alexander in 2012 contributed the following article on the harm of the wind power production tax credit (PTC). The NorthBridge Group report referenced in the article is available at Negative electricity prices and the production tax credit. While the PTC is a federal issue, the Kansas Legislature could do taxpayers in Kansas and across the country a favor by ending the mandate to produce more of this taxpayer-subsidized power. As Congress works to reduce spending and avert a debt crisis, lawmakers will have to decide which government projects are truly national priorities, and which are wasteful. A prime example of the latter is the production tax credit for wind power. It is set to expire on Dec. 31 — but may be extended yet again, for the seventh time. This special provision in the tax code was first enacted in 1992 as a temporary subsidy to enable a struggling industry to become competitive. 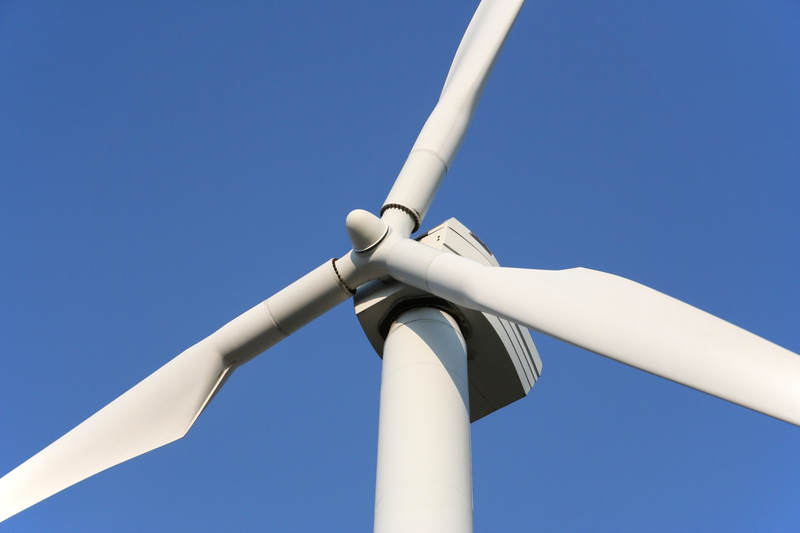 Today the provision provides a credit against taxes of $22 per megawatt hour of wind energy generated. 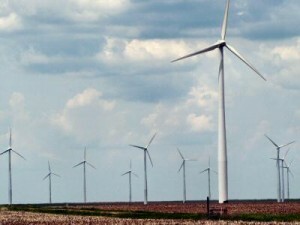 From 2009 to 2013, federal revenues lost to wind-power developers are estimated to be $14 billion — $6 billion from the production tax credit, plus $8 billion courtesy of an alternative-energy subsidy in the stimulus package — according to the Joint Committee on Taxation and the Treasury Department. If Congress were to extend the production tax credit, it would mean an additional $12 billion cost to taxpayers over the next 10 years. This is how it works. Coal- and nuclear-fired plants provide a reliable supply of electricity when the demand is high, as on a hot summer day. They generate at lower levels when the demand is low, such as at night. But wind producers collect a tax credit for every kilowatt hour they generate, whether utilities need the electricity or not. If the wind is blowing, they keep cranking the windmills. Why? The NorthBridge Group’s report (“Negative Electricity Prices and the Production Tax Credit”) finds that government largess is so great that wind producers can actually pay the electrical grid to take their power when demand is low and still turn a profit by collecting the credit — and they are increasingly doing so. The wind pretax subsidy is actually higher than the average price for electricity in many of the wholesale markets tracked by the Energy Information Administration. 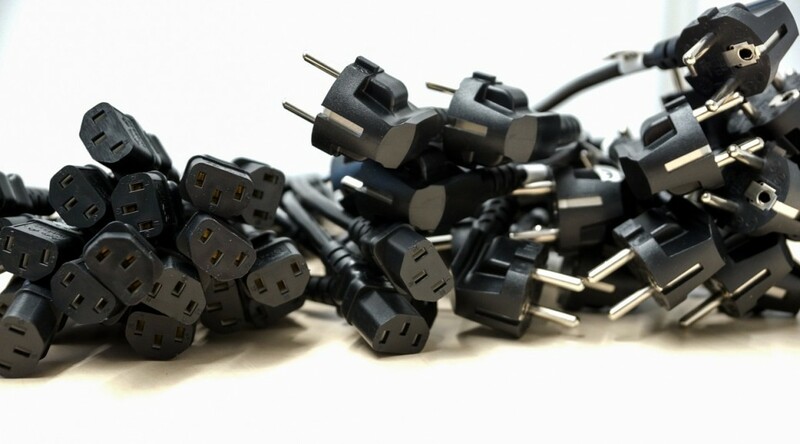 This practice drives the price of electricity down in the short run. Wind-energy supporters say that’s a good thing. But it is hazardous to the economy’s health in the long run. Temporarily lower energy prices driven by wind-power’s negative pricing will cripple clean-coal and nuclear-power companies. But running coal and nuclear out of business is not good for the U.S. economy. There is no way a country like this one — which uses 20% to 25% of all the electricity in the world — can operate with generators that turn only when the wind blows. 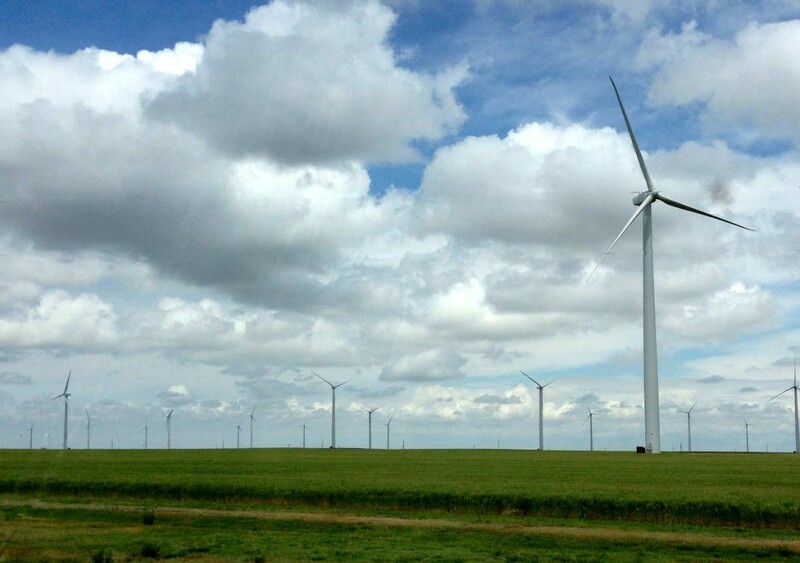 The Obama administration and other advocates of wind power argue that the subsidy provided by the tax credit allows the wind industry to sustain American jobs. But they are jobs that exist only because of the subsidy. Keeping a weak technology alive that can’t make it on its own won’t create nearly as many jobs as the private sector could create if it had the kind of low-cost, reliable, clean electricity that wind power simply can’t generate. While the cost of renewable energy has declined over the years, it is still far more expensive than conventional sources. And even the administration’s secretary of energy, Steven Chu, calls wind “a mature technology,” which should mean it is sufficiently advanced to compete in a free market without government subsidies. If wind power cannot compete on its own after 20 years without costly special privileges, it never will. The New York Times has provided a story on the future of advanced biofuels, using a plant under construction in Kansas as the centerpiece. 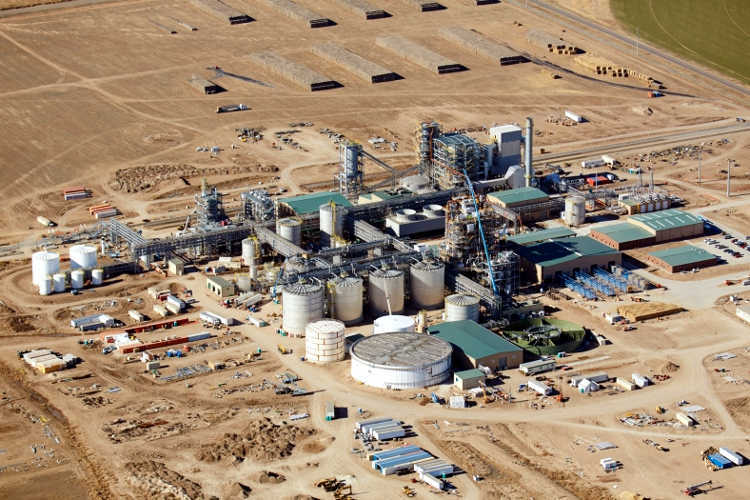 The plant, near the western Kansas town of Hugoton, produces cellulosic ethanol. Instead of using kernels of corn as input, the plant uses material like corn stalks and wheat straw. When the Hugoton plant starts operations in May, it will be twice as large as the largest plant currently in operation. The legislation requiring the use of advanced biofuels (Energy Independence and Security Act of 2007) was the product of a Republican administration. The executive vice president of Abengoa complains that the government is changing the rules. Experts are not convinced of the potential of cellulosic ethanol plants to be economically viable. A Canadian biofuel company wants the EPA to create regulations requiring the use of its product, and to provide incentives. The Kansas cellulosic plant has received a $134 million loan guarantee from the Energy Department, the same type of benefit the notorious Solyndra company received. No, I’m not talking about any federal tax subsidies or mandates to buy high-cost wind energy that have forced higher taxes and electricity prices on every citizen. This billion-dollar gift comes in the form of local property tax exemptions. In some ways, this handout is even more insidious because the cost is borne by a relatively small number of Kansas homeowners and employers in the rural counties where wind farms exist. Under current law, renewable energy producers enjoy a lifetime exemption from property taxes in Kansas. I testified last week in support of SB 435 to limit their property tax exemption to ten years. As shown on an attachment to my testimony, the Kansas Legislative Research Department says there is a $108.4 million annual difference between the small fees paid in lieu of taxes and the taxes that would be due if taxed at the regular rates within each county. So technically, the legislation would only “limit” the property tax gift to $1.1 billion over ten years on existing wind farms; more tax gifts would still be done on new wind farms and other renewable energy facilities. And while renewable energy producers were basically getting a free ride, property taxes on everyone else where going through the roof! Predictably, wind farm lobbyists lined up to protest that this legislation would increase their property taxes and send a bad message to the wind industry. Even local governments are opposed to taking away the exemption — after all, they can get their money from everyone else and take credit for bringing jobs and investment to their communities. They refuse to acknowledge that any economic benefit enjoyed by the green energy industry (and their own political benefit) comes out of the pockets of everyone else. P.S. Remember this billion-dollar gift the next time you’re angered by cronyism in Washington, DC. Bad players in Washington often learn their craft at the state level; fending off bad policy at the state level has many long term benefits. Primary U.S. energy production by fuel source, an interactive visualization. Source: U.S. Energy Information Administration, February 2014 Monthly Energy Review. Use the visualization below, or click here to open in a new window.